The Napoleon 1100C has an early American look, a single door with concealed hinges, ceramic glass and a convenient ash pan.This wood burning stove is of solid European cast iron design and an efficient wood burning technology. This classic stove will add a touch of elegance to any room. 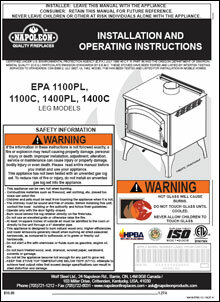 The Napoleon 1100C is the perfect wood stove for those wanting a reliable heating source year after year. EPA (Environmental Protection Agency) approved with emissions as low as 4.1 grams per hour and 69.8% overall maximum heating efficiency – more heat with less fuel. Ash dump with self closing door is readily accessible.